Contributions by the editors (Susy Frankel and myself) as well as Rebecca Giblin, Adrian Porcin, Margo Bagley, Ruth Okediji, Annette Kur and Estelle Derclaye. On May 30, 2017, the US Supreme Court released its opinion in Impression Products, Inc. V. Lexmark International, Inc., a case dealing with parallel importation of patented goods. What is the case about? In short, parallel importation. The below is an attempt to explain the underlying issues–in less than four pages. Parallel importation means an import of a good protected as a patent or copyright or bearing a protected trademark is ‘parallel’ to a domestic intellectual property (IP) right in the country of importation. Put differently, there is a ‘parallel’ IP right in the country from which the good is exported. The owner or exclusive licensee of the right in both territories may or may not be the same. The price at which the good is sold is often different (reflecting market conditions) thus creating an arbitrage incentive for export to a higher priced market. This is known as price discrimination. There is a relationship between the legal concept of parallel importing and exhaustion of rights at domestic law. When IP is embodied in a physical product, the sale of that product transfers ownership rights in the product, but not the underlying IP. For example, the person who purchases a copy of a copyright book cannot make and sell new copies of the book. However the distribution-related IP rights are said to be ‘exhausted’. This means that that copy of the book can be resold or otherwise treated as the property of the purchaser. If a country or trade territory allows the importation of a copy sold in another country or trade territory, then it is said to allow parallel importing. In this way the IP rights in both countries, or trade territories, are put in ‘parallel’. Exhaustion can be national, regional or international. In a national exhaustion regime, only rights in goods put on the market in that country are exhausted by a sale. In a regional exhaustion scenario, exhaustion applies to all countries in the region, as happens to most intellectual property rights in goods sold in the European Union. In the case of international exhaustion, goods sold anywhere the world can, subject to the more detailed explanation below, exhaust the right of the IP owner. Each country can make its own rules on parallel importation under the main international instrument regulating intellectual property, the Agreement on Trade-Related Aspects of Intellectual Property Rights (TRIPS Agreement). Then each country can also make different rulers on whether to allow parallel imports for different types of IP rights. Australia and New Zealand, for example, allow parallel imports of goods protected by trademarks and copyright but not patents. As noted above, the Supreme Court of the United States has now made it clear that US law allows parallel imports of goods protected by patents (Lexmark). It did the same in 2013 for copyrighted goods in Kirtsaeng v. John Wiley & Sons, Inc. (568 U. S. 519). This answers some questions for the US market but raises others. For trademarks the rule was already that goods cannot be parallel imported under their US trademark if they are physically and materially different than the authorized goods sold in the U.S. Let us consider the differences among different IP rights. Patents must be applied for country by country. In some cases (for example many European countries), a single patent application can cover several countries). Each patent granted is independent which means that if a patent challenged by an alleged infringer is found to be invalid by courts on one country a similar patent in a different country remains valid. There are rules in the TRIPS Agreement about patentability but countries retain a large measure of flexibility to define and apply patentability criteria. This means that the scope of a patent can vary by jurisdictions as each patent office can ask the patent applicant to revise the scope of the claimed invention. Then it is expensive to apply for a patent and inventors rarely if ever try to get an invention patented in every possible country. This means that many inventions are only protected in a few countries. Major multinational inventors that rely heavily on patents like pharmaceutical companies, often patent a new pharmaceutical in most significant potential markets, but not everywhere. Copyright, which protects books, music, film, software, pictures, art and many other forms of literary and artistic creations, can be obtained without formalities. Even in the US copyright registration is not fully mandatory. The protection of new original works is automatically available around the world to approximately 180 countries. Trademarks (like words or logos that typically identify the company that manufactured or supervised the manufacturing a product) are protected in countries that share a common law legal tradition because they are used in commerce in that country. In jurisdictions with a different legal tradition (including most of Europe), registration is generally required. Indeed, even in common law countries registration is recommended. This means that the owner of a trademark must take steps to protect a trademark in multiple countries and that worldwide protection is not automatic. Parallel importation of goods legally put in the market in a different country with the consent of the owner of the intellectual property right. Having said that, there are many different fact patterns that can arise. Let us assume the same goods are sold in countries A , B, C, D and E, with the following differences. Country E where the goods are not protected by patent (ether because no patent was ever applied for or because a patent was invalidated) and manufactured by a third party with no license from the owner of the patent in countries A-D. Question: Can the goods from countries B, C, D, and E be imported in country A? With respect to goods from country B, the answer (under Lexmark) is yes. With respect to goods from country C, the answer should be the same, again using the Lexmark rationale of a sale with ‘authority’ from the patent owner. With respect to goods from country D, one can say, first, that Lexmark does not apply because there was no ‘authority’ for the sale from the patent owner. Second, there are specific international rules with respect to patent compulsory licensing that limit re-export of patented goods made under a compulsory license such conditions, especially art 31(f) of the TRIPS Agreement. An amendment to TRIPS (Art. 31bis) modified this rule for phamarmceutcial exports to least-developed nations. The amendment contains detailed rules concerning diversion to more economically developed markets. In the copyright field, by contrast, compulsory licensing is allowed in certain circumstances. For example, under the Appendix to the principal international copyright instrument, the Berne Convention, which was incorporated into the TRIPS Agreement, developing countries can issue reproduction and translation licenses for books. Compulsory licensing of trademarks is generally not permitted (TRIPS Agreement, art. 21). Country E is a somewhat harder question. The rights cannot have been said to be exhausted because there were never any rights to exhaust so that the traditional rationale for parallel importation should not apply. Yet the goods are undoubtedly legal in their territory. Lexmark, by focusing on the import of authorized goods seems to assume exhaustion and the answer would, therefore, be no, the goods cannot legally make it into country A. The main rationale against parallel importation of goods protected by copyright or a patent is that it prevents price discrimination. 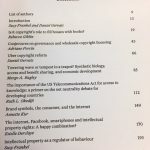 In the copyright field, a book publisher can charge a different price depending on the perception of what the market can bear in that particular country. When international exhaustion applies, a publisher might decide not to publish ion lower-priced markets to avoid diversion to more expensive ones, as had happened in Kirtsaeng. In that case a student had purchased authorized books in Thailand and brought them back into the United States and was able to resell the books undercutting the average US sales price by quite a significant margin. Being allowed to charge the maximum price possible in all markets allows both to charge more on “richer” markets and less in less economically developed ones. This can create a subsidy effect where richer buyers subsidize the owner of the intellectual property right to create and invent more. Finally if the owner of the IP right has given an exclusive license limited to one territory (say country C in our list above) and goods produced by the patent owner itself (or by a different licensee) in another territory (say, country B in our list above) can be exported to country C, then the exclusive licensee in country C might suffer economic harm as a result. The main rationales for parallel importation of goods protected by copyright or a patent are, first, that it allows a country to obtain cheaper goods by importing them from a market where they are sold at a lower price. Relatedly, it can be used to introduce competition into an otherwise non-competitive market, which should also exert a downward pressure on price. Finally, it can be used to expand the range of available products and their varying qualities if only a limited range is locally available. All these rationales are directly linked to consumer welfare narratives. It is also essential to take account of the fact that patents and copyright apply to different types of goods. A copyrighted work is usually purchased by individual consumers, while important categories of patented goods such as pharmaceuticals are often purchased by state entities in charge of public health systems. 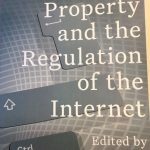 There are significant public welfare impacts when access to books and medicines is restricted but there is very often a substitute for a book, musical work or film–a pharmaceutical product may have no substitute–and substitutes for copyrighted material are also often freely available online. Consequently, the public health impacts of restricting access to patented goods are often heavier than those that come from restrictions to specific copyrighted works. In the case of copyright, there is another reality to factor in: billions of works cross borders every day because they are available online. This changes the contours of the debate about parallel importation in that context. In the case of trademark goods, the debate about parallel import rationales is somewhat different. Trademark rights are not protected, unlike copyright and trademark, as a reward or incentive for creating or inventing something. They are, at least as a matter of theory, designed to avoid confusion among potential buyers. Thus if a good imported from country B is the same as the one sold under the same trademark in country A, there is no confusion and the rationale for preventing importation isn’t clear. It is quite likely that the pharmaceutical industry will try to get the US Congress to ‘overturn’ Lexmark by amending the US Patent Act. It was said that copyright industries would do the same after Kirtsaeng but no amendment has been made up to now. It is also likely that at least some producers of patented goods will modulate their price discrimination strategies differently. Many products that can be purchased in foreign markets, often using online resellers. Two issues should arise in that context. First, quality assurance will be used to convince buyers not to acquire goods from foreign sources. Attempts to block imports of pharmaceuticals (say, from Canada to the US) are often justified not on patent grounds but as a safety (regulatory) issue. That route may be explored further. Second, goods that require maintenance or service acquired from foreign sources may not benefit from locally available extra warranties or ‘service packages’ that companies may offer as an incentive to buy from a local (or at least domestic) source. Thanks to Professor Andrew Newcombe & Co for their great website. 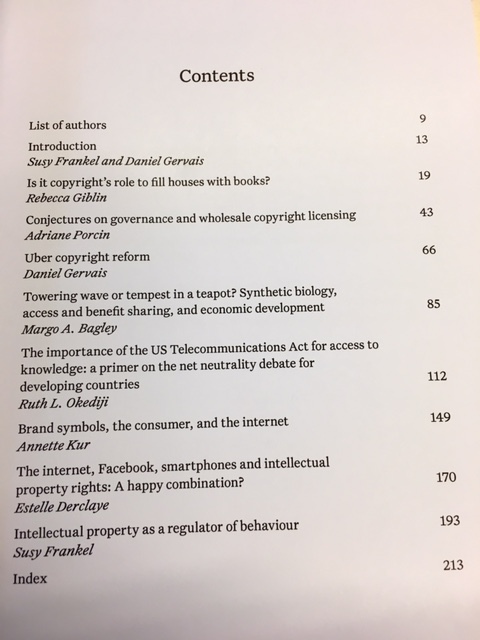 My new book (Re)Structuring Copyright, the first in the new Elgar Monographs in Intellectual Property Law, is now available. Thank you in particular to the series editors, Professors Graeme Dinwoodie, Rochelle Dreyfuss and Annette Kur. A book launch event will take place at Vanderbilt Law School on April 27 at 5:00 PM. Professor Chris Sprigman (NYU) and Robert Barsky (Vanderbilt) will comment on the book. This book aims to inform the debate about the future of copyright and its influence on human creativity. It is possible that, in a few years, all books will be the product of artificial intelligence and a version of Bob Dylan’s songs will be written by the son or daughter of IBM’s Watson. We are not quite there. Copyright has been, and is still, linked to many forms of (human) literary and artistic creation. Literature and art are perhaps the most vivid mirror of a society, its deepest aspirations and fears, its horrors and its magnificence. How policy affects that creation is, therefore, crucial to future human progress. In common parlance, ‘artists’ create Art. In copyright, we call artists ‘authors’. We could call them ‘creators’. Art is used and often owned by those who distribute, disseminate, package, and sell it, to be enjoyed or used in one form or another by all of us. Art then enters a cycle of appropriation, reuse and transformation, sometimes leading to more creation. Creation has a very broad meaning in the copyright realm. It includes ‘art’ proper but also non-fiction writing and many more utilitarian forms of creation such as maps and (certain) computer programs. Some quality contributions to human progress are created by amateurs, from deeply influential essays to child prodigy music composers. Talent—however that term is defined—seems not to have been distributed evenly; yet even abundant talent needs to be honed, nurtured and developed. Mozart started composing as a child but few of the works he wrote before the age of 21 are among the ones people listen to on a regular basis two and half centuries later. That nurturing is a key function that copyright, properly structured, can accomplish. 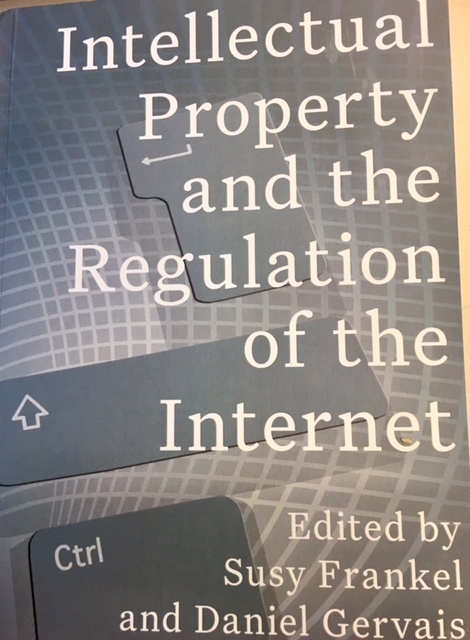 This book proposes a way to structure copyright internationally to achieve this aim. There are no doubt many other ways to get there, but I can think of no higher policy objective. There is a fundamental ‘anthropological’ aspect to the quest for human development and policies that support it, although there is a sheer economic argument to be made as well: in the ‘knowledge economy’, creativity replaces material goods. Immaterial capital displaces physical capital. Knowledge is a commodity in itself; it is increasingly produced not to support the production of material goods (e.g., an improvement on a physical device) but for its own exchange value. As a matter of human and economic development, policy must ensure that those who can, and will, push their creative limits, including in developing new knowledge, can do so. True, technological changes make the policy work ahead harder. Those changes will alter in unforeseeable ways the interaction between humans and machine. Whether humans adapt to the machine (think of all the people walking with their heads down looking at a small glass screen) or whether the machine helps human creativity and potential flourish is the next great question. Law and policy can only influence the course of events up to a certain point, in part because regulatory interventions are so often educated guessing at best. Yet the inversion that André Gorz and others have described—the economy serving humans rather than the other way around—is the best possible outcome. Good policy can maximize our chances of getting there. Copyright is not the only tool in the policy toolbox of course. It forms part of a broader set of policies known as intellectual property (IP) and IP itself is part of an array of cultural and economic levers available to policy makers, from tax credits and subsidies (ex ante tools) to awards and prizes (ex post tools). The copyright system remains front and centre in this discussion, however. Yet it is a broken system. Not surprisingly, many voices have called for copyright (and sometimes all of IP) to be jettisoned as an obsolete industrial revolution era policy dinosaur. The early days of the Internet led the Grateful Dead’s John Perry Barlow to declare copyright dead. It is not. Others have made it their task to reduce copyright to its simplest expression, reflecting an underlying assumption that copyright is a negative—as little copyright as possible is necessarily a better outcome. Perhaps calls for reduction are merely a reluctant acknowledgment that it is unrealistic in this era of trade rules to think that copyright can be scrapped entirely. There are two other ways to see such recent developments. One is a cynical view. Many major commercial ‘intermediaries’ whose business is to sell advertisements need ‘content’ in myriad forms to draw users to their apps, sites and services. Whether it be a cat video or a Fellini movie, a recording of a high school band or a Puccini opera, a blog-post or a Jane Austen book matters not to them. I submit that it should matter to us all. Indeed, this concern must inform proper copyright policy. The other way to see recent developments is to embrace them, because they do lead to progress in a number of areas. The idea that entire libraries of paper books can be word-searched online is clearly a positive development, leaving aside for now the idea that those who write those books need not be remunerated for the uses of their works. The power of the Internet to disseminate new creations worldwide at little or no cost is a powerful tool to level the distribution playing field (for example by allowing anyone to publish an ebook) and potentially bringing all cultures, not just major players, to ‘users’ worldwide. Digital tools that allow amateurs and professionals to create, modify and add their own creativity to existing works can allow new creations to emerge and flourish, although it can also lead to ‘lazy’ creation by copying. Imitation has always been of the human creative process and this has now been raised to immeasurably higher levels, for both good and bad. More ‘content’ is a good thing. More good ‘content’ is a far better thing. By ‘good’ I mean the type of work that alters our perceptual filters, forces us to think and rethink our world, moves us, and hopefully can make us better humans. Sometimes it is hard to know which is which. The initial failure of many new forms of art, including the famous rejection of the Impressionists by the bourgeois Parisian elites, come to mind. It is clear, however, that to achieve those aims new ‘content’ must not only be created, it must be made available. Current policy efforts aimed at providing new and stronger ways to take down unauthorized content are thus often misguided, although not in cases of straight piracy that add no value. We should aim not to take content down but to put more good content up. And all of that cannot and should not happen at the expense of those who have spent their lives honing their craft and/or by preventing new creators to do so. An equilibrium must be established—it can be done. The current lack of equilibrium and the deficient structure of copyright results, in part, from a process of historical changes and accretions to the list of copyright ‘rights’ and in part from a lack of clarity as to its purpose. Indeed, very few national laws state one or more purposes of copyright. European Union Directives often mention several aims in their recitals. The definition of a purpose is often seen as a binary exercise. I have been asked so many times what ‘side’ of copyright I was on. Must one side win? This book takes the view that we can all ‘win’. The United States Constitution is a helpful guide. It is unique in that it states the purpose (Progress of Science and Useful Arts), beneficiaries (Authors) and mode of implementation (Exclusive Rights in ‘Writings’, for Limited Times) of copyright. Copyright should promote ‘progress’. Words matter. This means that copyright is not needed to promote mere ‘change’. Change happens no matter what. Progress, not necessarily so. In his 1974 Invitation to Jurisprudence Professor Harry Jones noted that not all forms of change are progress. Change that is not progress means moving sideways or going backwards. Change is merely a difference between two points (A and B) on a timeline. Progress is an improvement at point B. Progress does not mean that there is an end-state that we must identify, such as Fukuyama’s initial description of an End of History. But human progress, its emancipation, through science and the arts, is surely progress. That said, governments, courts and policy makers cannot and should not dictate the direction of societal and technological change. Cultural memes and economic forces are too powerful to resist, and often they lead change that does constitute progress. But I submit that it is the role of all branches of government to promote progress by ensuring that a larger proportion of change is progress. It is the role of academics (among others) to illuminate the economic, sociological, philosophical, and historical underpinnings that can then inform the thinking about how policies can affect the degree to which change will lead to progress.